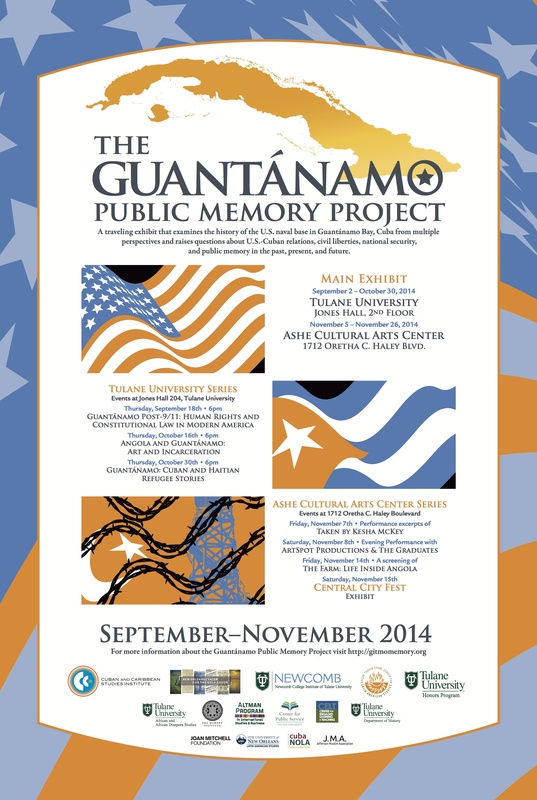 The Guantánamo Public Memory Project is now at Tulane until October 30th, 2014. The Guantánamo Public Memory Project is a traveling exhibit that examines the history of the U.S. naval base in Guantánamo Bay, Cuba from multiple perspectives and raises questions about U.S.-Cuban relations, civil liberties, national security, and public memory in the past, present, and future. There will be a lecture series including panels on Guantánamo Post 9/11 on September 18th, Angola and Guantánamo on October 16th, and Guantánamo: Cuban and Haitian Refugee Stories on October 30th. All events will be on Thursdays at 6PM in Jones Hall 204. After Tulane, the exhibit will move to Ashe Cultural Arts Center on Oretha C. Haley Boulevard until November 26th.